Klimovieovta M, Skoracki M, Wamiti W, Hromada M. 2014. Quill mites of the subfamily Picobiinae (Acari: Syringophilidae) parasitising African birds, with description of two new species. Folia Parasitologica 61(5):394-400. Abstract. Two new species of the subfamily Picobiinae (Acari: Prostigmata: Syringophilidae) are described: Picobia ploceus sp. n. from Ploceus ocularis Smith (Passeriformes: Ploceidae) and Picobia lamprotornis sp. n. from Lamprotornis superbus (Ruppell) (Passeriformes: Sturnidae), both from Kenya. Additionally, new hosts are recorded: Turdoides jardineii (Smith) (Passeriformes: Leiothrichidae) from Kenya and Tanzania, T. rubiginosa (Ruppell) from Kenya, T. leucopygia (Ruppell) from Zambia and Namibia, for Picobia dziabaszewskii Glowska, Dragun-Damian et Dabert, 2012; Pycnonotus barbatus (Desfontaines) (Passeriformes: Pycnonotidae) from Kenya, for Picobia pycnonoti Glowska, Skoracki et Khourly, 2007; Dendropicos griseocephalus (Boddaert) (Piciformes: Picidae) from Tanzania and D. goertae (St. Muller) from Kenya, for Neopicobia freya Skoracki et Unsoeld, 2014; Dendropicos fuscescens (Vieillot) from Zambia and Campethera nubica (Boddaert) from Kenya, for Picobia dryobatis (Fritsch, 1958). A new quill mite is described from a Spectacled Weaver caught on 16 November 2012 at Soysambu Conservancy, Kenya. 5-10 body feathers were collected from the weaver. Quill mites spend most of their entire lives inside the hollow central shaft or quill of a bird's feather. The mites move to new feathers on the same bird when it is moulting. Female mites disperse to other individual birds of the same species through direct contact, eg. from a female to her nestlings, which then carry them for the rest of their lives. Different mite genera may be specific to a feather tract and only live in one type of feather in the host plumage, eg primary feathers, secondary feathers, tail-feathers, or body feathers. 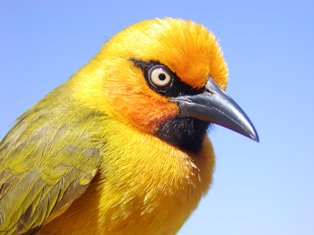 Read more about the Spectacled Weaver at Spectacled Weaver.